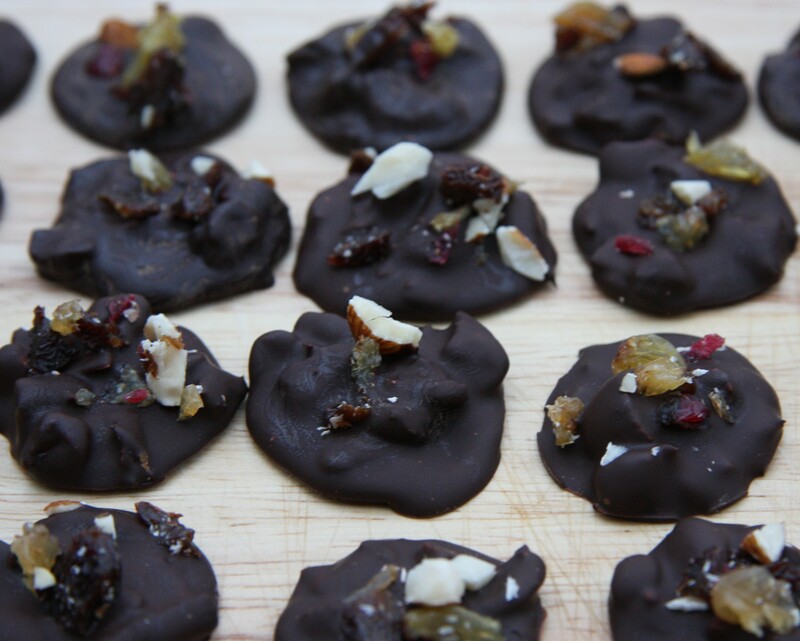 One of my favourite combinations: plain chocolate, dried fruit and nuts. 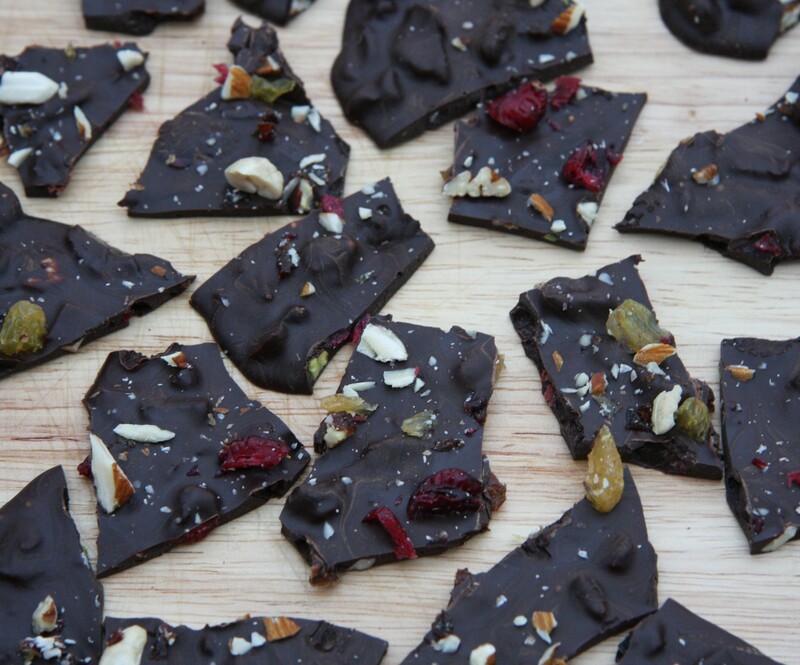 So easy to make, so delicious and perfect to take to a friend’s as a gift. It’s a good idea to make these with someone in mind or you will end up eating them all yourself! Either way they won’t last long. My friend Gilly has been making these for a while as gifts and I can’t believe it’s taken me so long to try them out. I used mixed nuts and fruit but you could use pretty much any of your favourite dried fruits and nuts on their own, or in combination. It is important to use good quality plain chocolate. 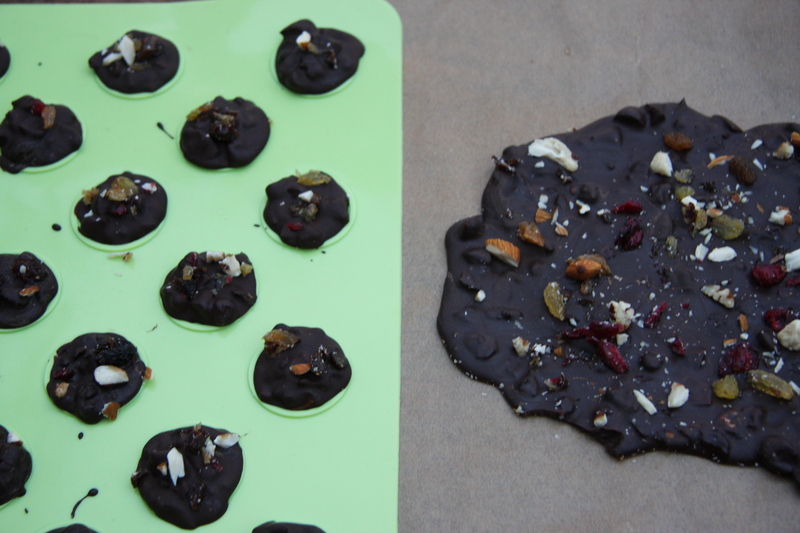 By weight I used roughly half the amount of dried fruit and nuts to chocolate. 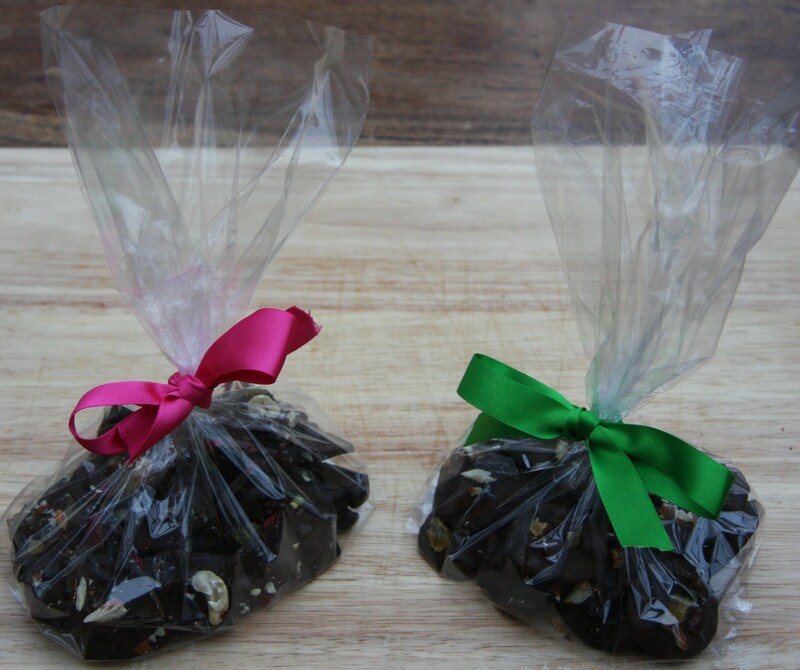 I melted 200g plain chocolate and used approximately 100g dried fruit and nuts, chopped up into smallish pieces. I stirred the majority of the fruit and nuts into the melted chocolate and saved some to top the chocolates. When you mix in the fruit and nuts just add more or less depending on the consistency you want. Obviously nuts are much heavier than dried fruit so you would need a lot less dried fruit by weight. Chocolate needs “tempering” so that it doesn’t develop white patches when it cools. In other words it needs heating up to the right temperature before being cooled again. If you don’t have a chocolate thermometer, which I don’t, there is an element of risk! I think I got lucky this time. I don’t think the white patches change the taste so you can always eat those yourself and start again if you feel you need to. Scatter your toppings over the melted chocolate and then the hardest part: waiting for it to set properly. At this point you need to resist the urge to eat the whole lot. I recommend bagging it up as soon as possible! I started by putting the discs into one bag and the pieces into another but in the end decided it would look just as good all jumbled up so I put it all in one bag. A ribbon is all you need to finish it off. I am sure I will be making a lot more of these. I have loads of different flavour combinations I want to try and I think homemade chocolates have a lot to offer: and not just for me! ‹ Traditional Easter Biscuits – not a bunny in sight! They are beautiful, delicious and a great idea! I’ve never made these but I’ve always wanted to. Thanks for reminding me! Would you mind if I pinned this post to my Pinterest board to try out later? I would be delighted, thank you! I’ll favourite this recpie to use for christmas gifts! Quality dark chocolate is the best. You are very kind! It will be two years this summer, still learning loads!